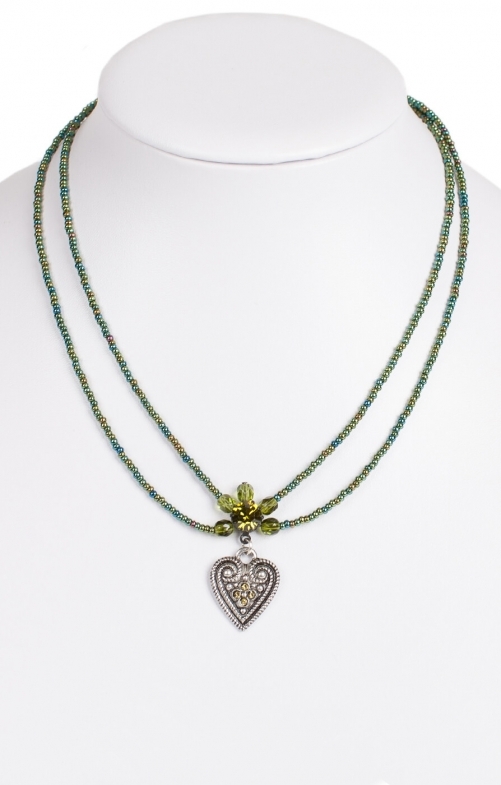 Colourful olive bead necklace with silver heart pendant. This beautiful traditional necklace stands out with the variety of colours on its two rows of glistening round beads. Aquamarine blue, moss green, olive and brown blend to create the illusion of iridescent petrol. They’re joined under a shimmering peridot crystal surrounded by faceted beads, from which a heart-shaped nickel-free silver pendant dangles freely, ready to express a message of love for a special lady this Oktoberfest.